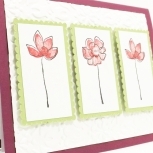 Enjoy a clean design on this hand made "for you" card (with envelope). The simple lines make it perfect for him or for her. The background paper is a red-purple that I have embossed with a raised pattern for textural interest. A thin ribbon tied with a knot with the clean type "for you" sentiment keeps the unisex appeal. 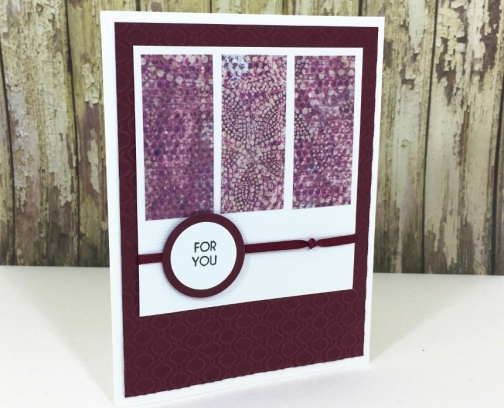 The purple, spotted patterned paper provide an effect reminiscent of bokeh. The card measures 4.25 inches (11 cm) by 5.5 inches (14 cm) and comes with a plain, white, self sealing envelope. The inside of the card is blank so you can write your message.